What goes better with a deep, lustrous tan than brilliantly white teeth? 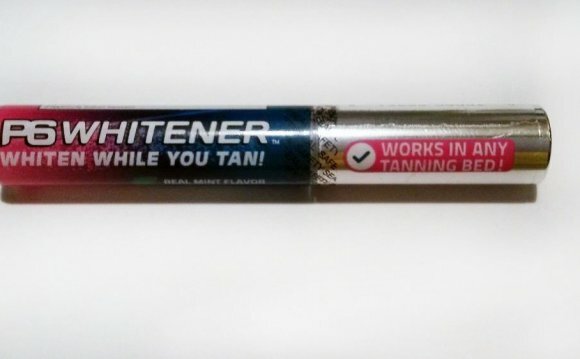 With TAN WHITE™, now you can WHITEN WHILE YOU TAN™. TAN WHITE is the ultimate UV teeth whitening kit with maximum-strength whitening gel for the most dramatic whitening in the least amount of time. TAN WHITE is very easy to use. It comes complete with SPF 15 lip balm to protect your lips, a specially designed cheek retractor that also protects lips while exposing teeth to UV rays, and high-powered whitening gel in a handy pen-style applicator. The kit also comes in a super cute silver carry case with a mirror inside. The mirror makes it easy to apply the gel while in the tanning bed. Your white smile will stand out in stunning contrast with your deep tan! LIP BALM INGREDIENTS: ACTIVE INGREDIENTS: OCTINOXATE 4.5%, OCTISALATE 2.5%, OXIBENZONE 1.5%. INACTIVE INGREDIENTS SOYBEAN OIL, ORGANIC PALM OIL, BEESWAX, ORGANIC EXTRA OLIVE OIL, ORGANIC HEMP OIL, COCOA BUTTER, VITAMIN E, AVOCADO OIL, ALOE VERA, FLAVOR OIL.